I had a card sent to me once that had a picture of some comfy looking Wellington boots and a caption ” wellies make you brave” it’s true , and I hope the amount of boots we own must make us warriors.. it’s not bravery that anyone needs ,the thing is , is to have a plan. And yes they make me brave. I’ve decided to keep a blog , like a diary only it’s not exactly private .. the reason for this need to publish is to share our big idea in the hope of inspiring others to wear wellies , come up with a life plan and get brave .. Anyway the plan ! It was either brave or stupid we think it was just a sensible logical move to improve our family life . Family life had become work work school work school shopping work washing work you know how it goes , then factor in some Autism, and it’s all not looking so rosy. So our evil and cunning plan was to put all our finances into a new home up in Scotland where all our R&R took place . A home where we could all live and work together so business ideas began to form and collect ( in a file) . The main theme was that it needed to be something all of us could be involved with and therefore improve our family life. Also because our daughter Lauren has learning differences ( yes differences not difficulties)and is on the Autisitc spectrum we needed to think about involving her at every stage with a view to her potentially living and working as independently as possible sometime in the future. The plan was to utilise the buildings and land to bring in a lifestyle and small income ,enough to live on and prepare Lauren for a working independent life, reduce Andys blood pressure and keep me in my wellies for as much as the day as possible . There is a whole blog to write just on selling a house in England and buying a property in Scotland , but it’s finger tappingly sad and sorry so I’m going to jump right to Grobdale of Girthon . We had sold our house, moved into a rental , had more cross words and pointy fingers in 10 months than in 30 years of our relationship ! At Christmas a decision had to be made on what to do as tensions were running high . We came to an agreement that a property “somewhere rural” would be chosen and bought by Easter . We carried on making trips and booking viewings in wales,Northumberland,the lakes and of course Dumfries and galloway our favourite area but after each fruitless trip we became more and more depressed. we had had to postpone a trip to the highlands from October to the following march due to a family sadness however it seems that this holiday was meant to be ..
We re booked the holiday in the highlands and loved our week enjoying the open landscapes and the businesses that thrived there .We finished off the break during the Easter weekend 2017 with some viewings in Dumfries and galloway.We saw a very overpriced farm on the Sunday morning and then travelled a few miles in land to view a farm with a very funny name about lunchtime on yes you guessed it Easter Sunday ! 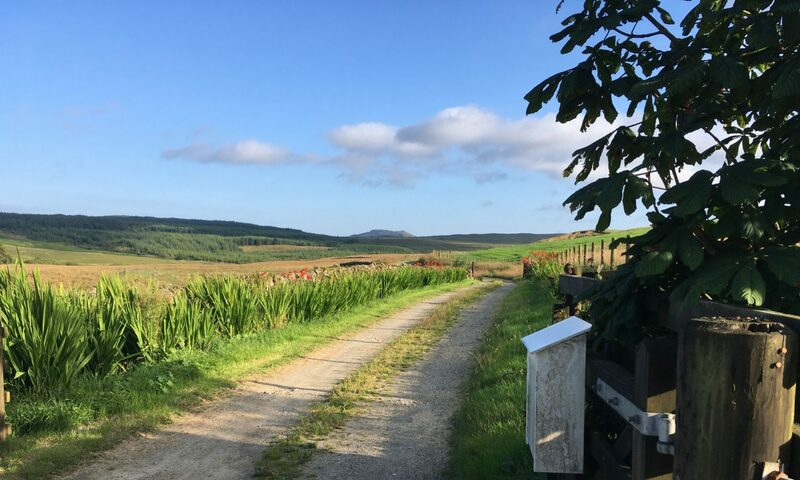 The minute we started down the track to the property we started to Smile , it was so like the highlands we had just left and enjoyed I think it was love at first sight. We were shown around by the owners who it seemed had only been there 10 months ! Apparently as their removal van pulled away John had had major second thoughts and knew that he couldn’t live there , within the week it was back on the market . The rest is agent and solicitor stuff but we managed to secure a sale and moved in on the 4th of July (yes I know Independence Day ) . Brilliant ! Succinct and readable ! Keep up the good work, Sarah. Refreshing reading !